I have no time left to dance with this unwanted stranger. I have no more tears to shed for this pariah. I am throwing away the shroud that threatens to smother me. Saying goodbye to some things are not always moments full of sorrow and regret. Saying goodbye to an illness that is holding you back from focusing on things in life that make you happy, is a gift you give to yourself. For my sons who together, hold the whole of my heart. For my mother whose gentle spirit enfolds me in invisible love. She watches from the ethereal, encouraging me to stay strong when fear’s tentacles threaten to entrap me. For myself. I had forgotten who I truly was. I was buried in layers of insecurities, fear and doubts. I am finding myself with each layer I peel away. For my future in which I envision myself surrounded in love. Pleased in the assurance that my soul has grown in this cycle of life here on earth. For I still have things to accomplish in this life. Opportunities full of promise, still await. Start saying goodbye by not letting any negative circumstances consume your every thought. Do not give it energy to fuel the flame of emotions that only leave you drained. Stop and take a few deep breaths and calm your thoughts. What is it that is really upsetting you in that moment? If it is something that you do not have any control over in that moment, let it go. Give yourself permission to trust that you will be alright. If an outfit in your closet no longer fits, you do not put it on and go out to meet new friends. You give it away. You find new ones that fit who you now are. Free yourself from whatever is keeping you tethered. You are more than your illness. Rise above the limitations that are holding you back and let go of things that do not empower you. For it is just an empty husk that no longer fits. 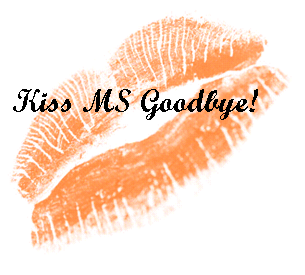 1 Response to Kiss MS Goodbye!